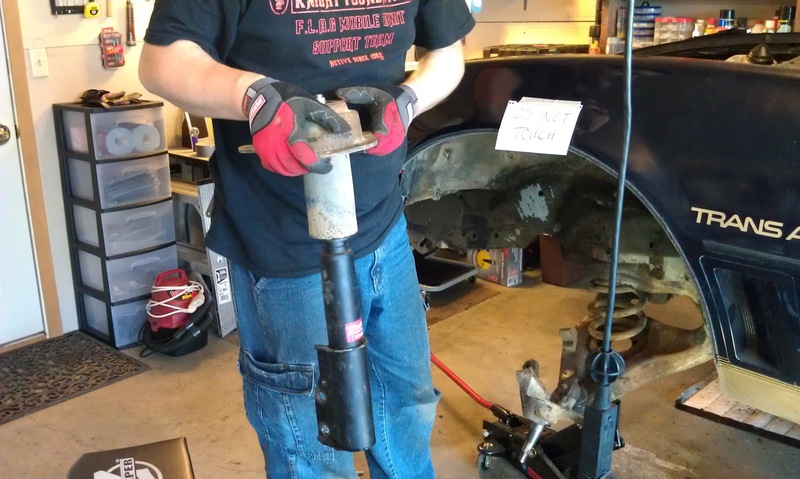 After the recycling center we went to O'Reilly Auto Parts and rented a Ball Joint Press. Their tool rental program is really neat. As the sales guy explained it: "You pay full price for it now, and you have 48 hours to bring it back and get your money back. 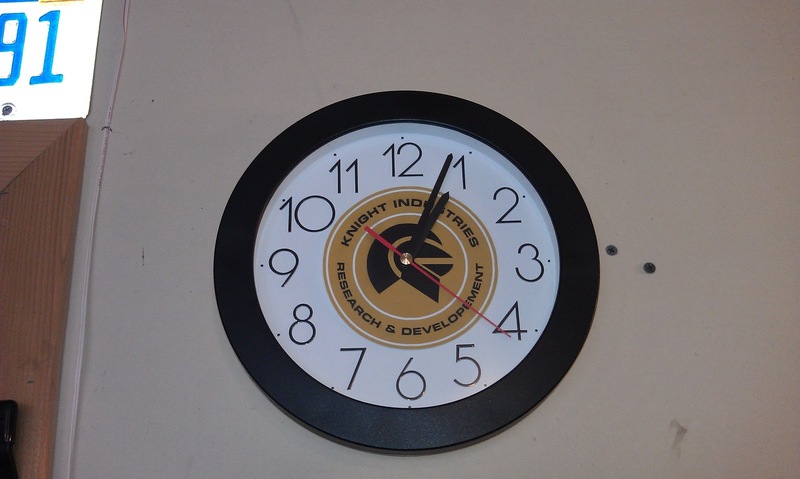 If you don't bring it back in 48 hours, then you just bought it." 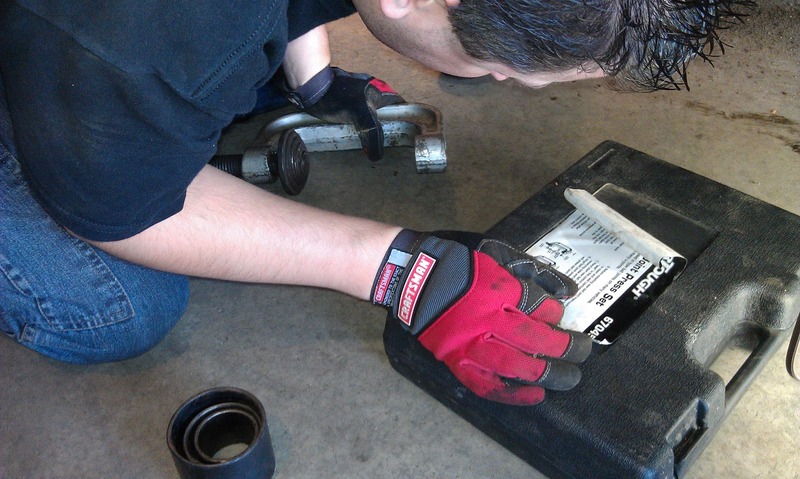 Here is Jonathan reading the instructions for the Ball Joint Press. 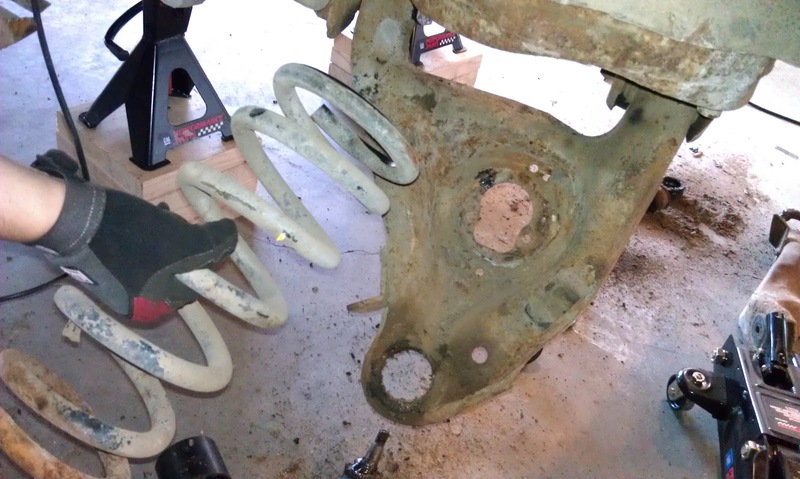 We thought this was going to be a nice simple process once we had acquired the Ball Joint Press. We were wrong. Jonathan figured out the strut was in the way and would prevent us from being able to get the press in place, so he had to take the strut off. 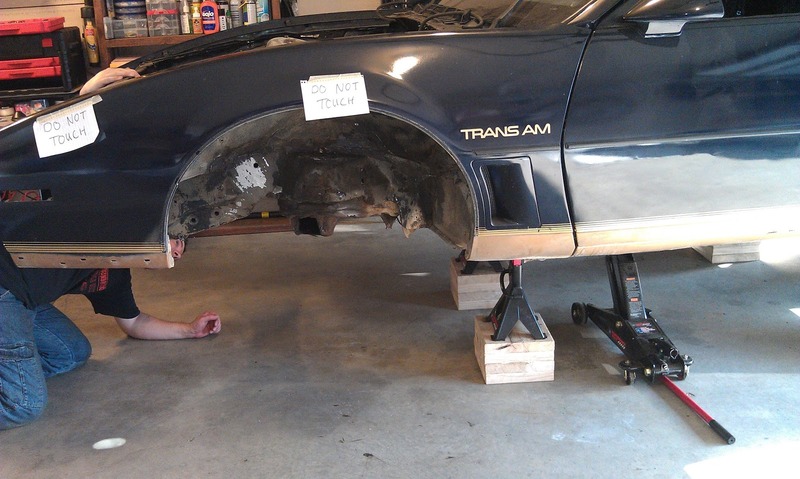 We placed the jack back under the A-arm and raised it just enough to put the car's weight on the A-arm. 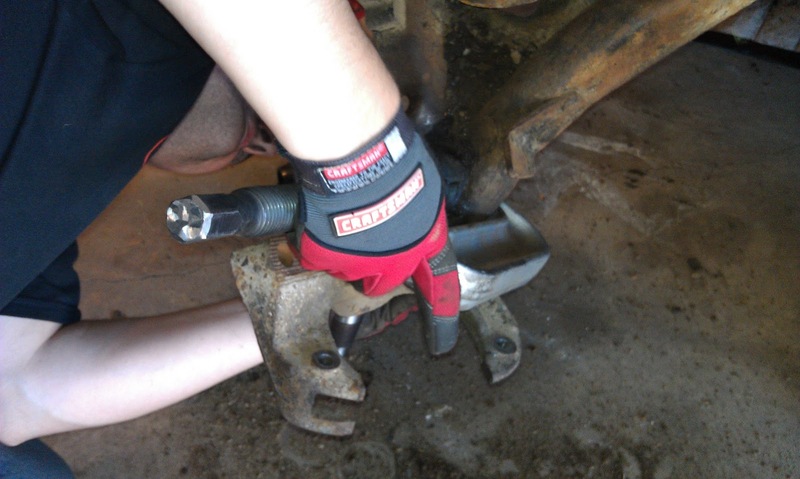 Then Jonathan attempted to remove the bolts and once again the hand tools were not cutting it. Jonathan called Troy and asked to borrow the impact driver again. We made a quick trip and picked it up. Thanks again Troy! I am missing a few pictures here because my hands were full. 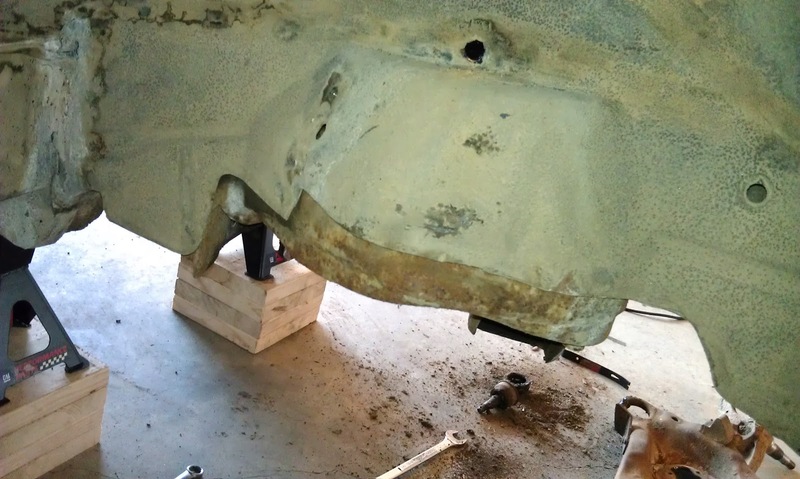 The bolts apparently were seized and were nearly impossible to get off, even with the impact driver. The bolts did eventually loosen. 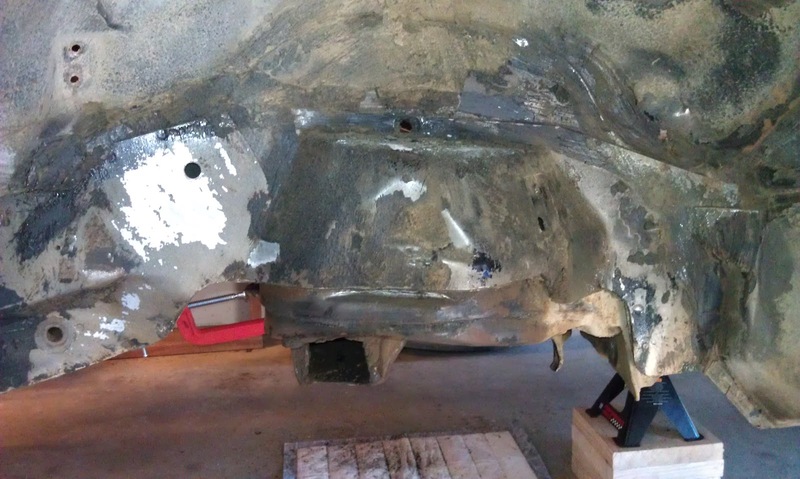 When we pulled the last bolt out the force was enough to pop the car into the air. It was one of those "Glad I stood back in time!" moments. 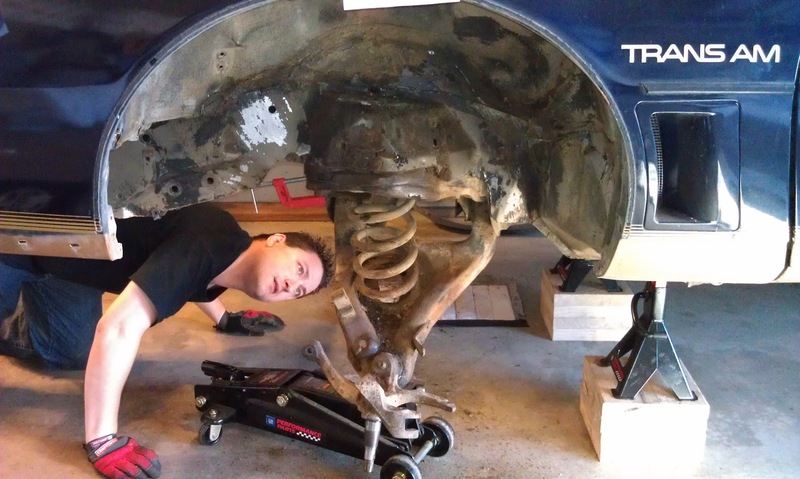 Once the bolts were removed, Jonathan lifted the strut up and out of the car. Yes! We are done with this side! Strike that; we are not finished yet. 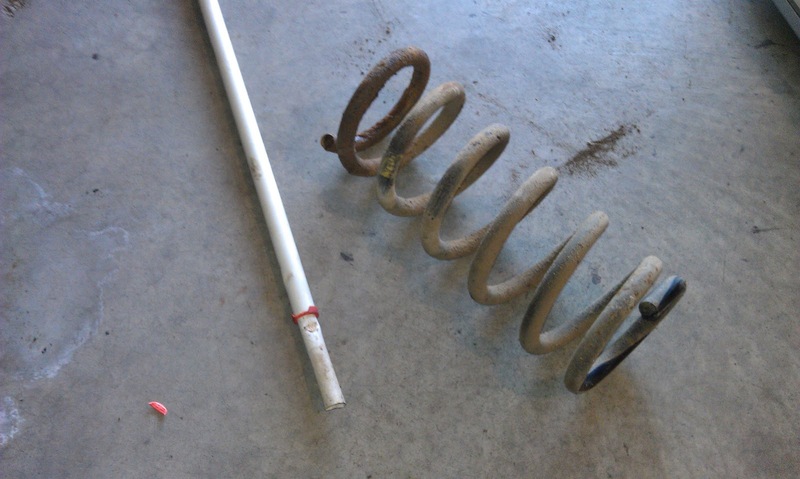 We still have to remove the spring. Jonathan tried to position the Ball Joint Press following the instructions on the case. He could not get it to work. I suggested finding a video on the internet. He found one, watched it, and tried again. 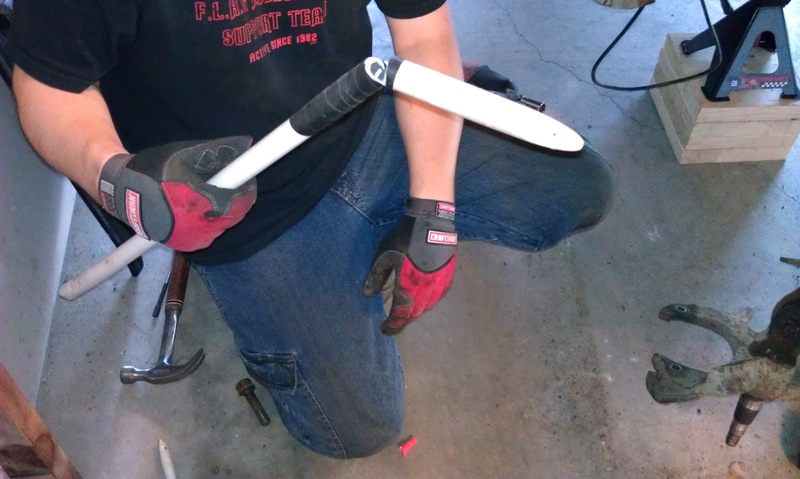 Jonathan got out my mop handle and attempted to use it as a cheater bar to "crank it down harder". 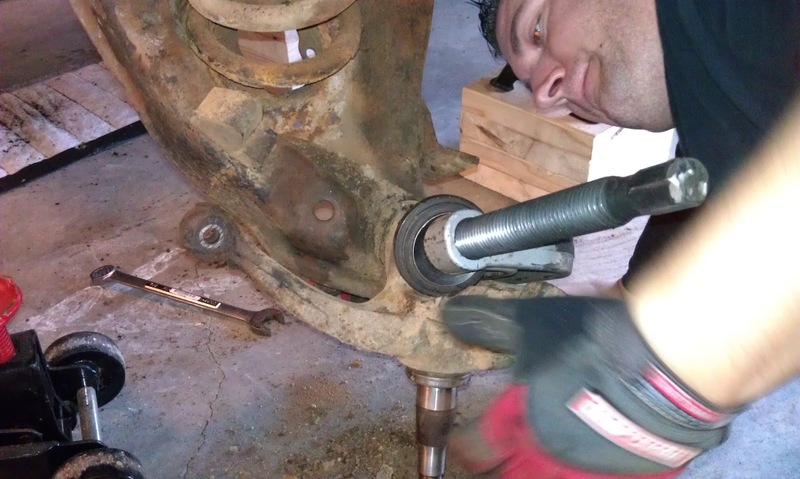 Jonathan decided before giving up completely to ignore the instructions and just try the Ball Joint Press the way he thought it would work. 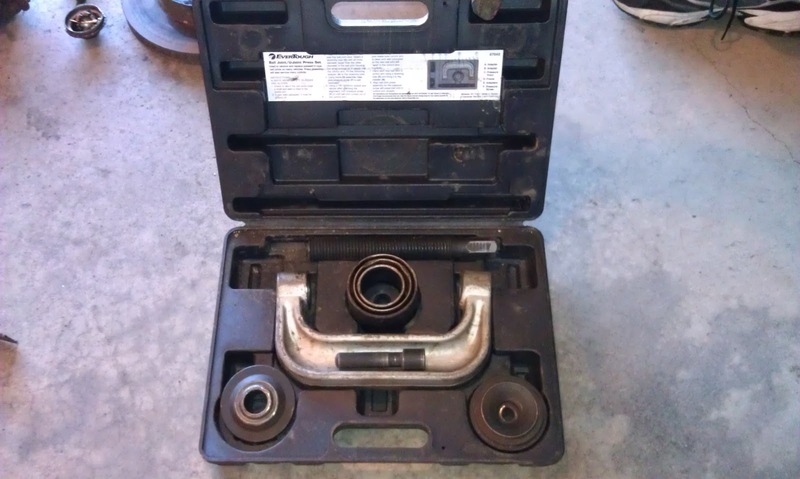 The Ball Joint Press looks like a C-clamp. On the C part of the clamp, the one side is threaded and the other is just open. 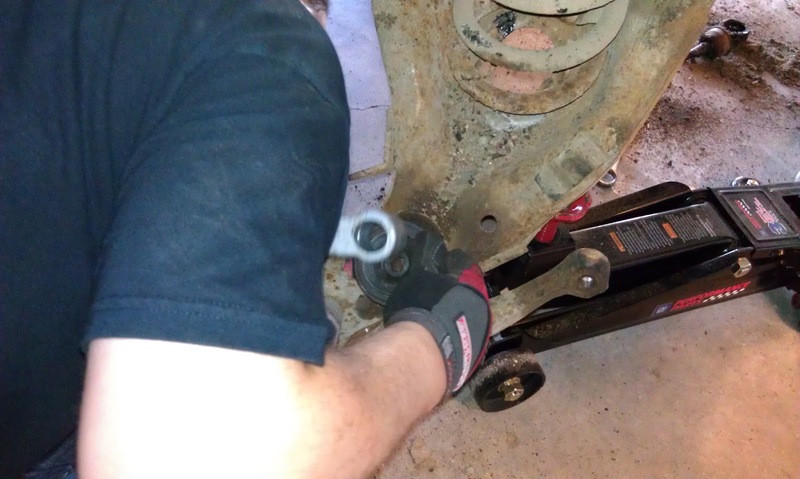 The disc and a cylinder larger than the ball joint goes on the open end and goes under the A-arm, positioning the ball joint inside the cylinder. The disc used with the cylinder has steps that each size cylinder will sit in. The opposite side has a groove that fits into the open end of the C-clamp. The other disc has a sort of beveled edge (like a shallow funnel) and an opening for the threaded bolt to pass through. The other side of the disc is flat. 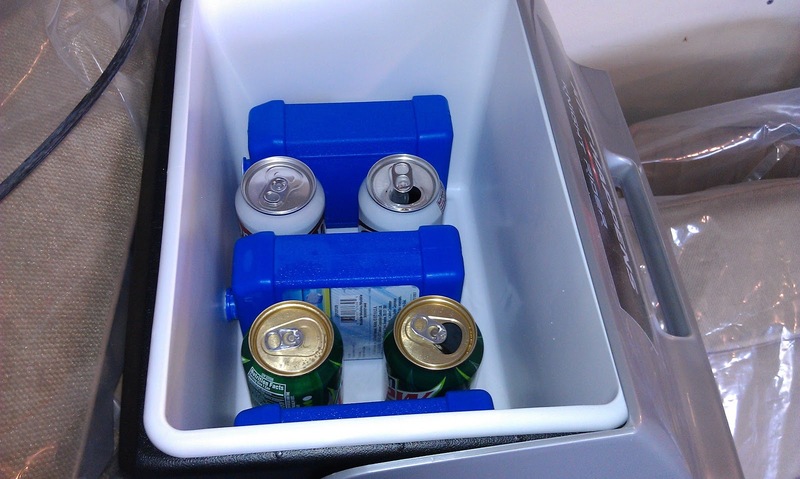 This sits on top of the stud on the upper part of the A-arm with the funnel side facing up. (This is the stud we had to take the castle-shaped nut off of.) 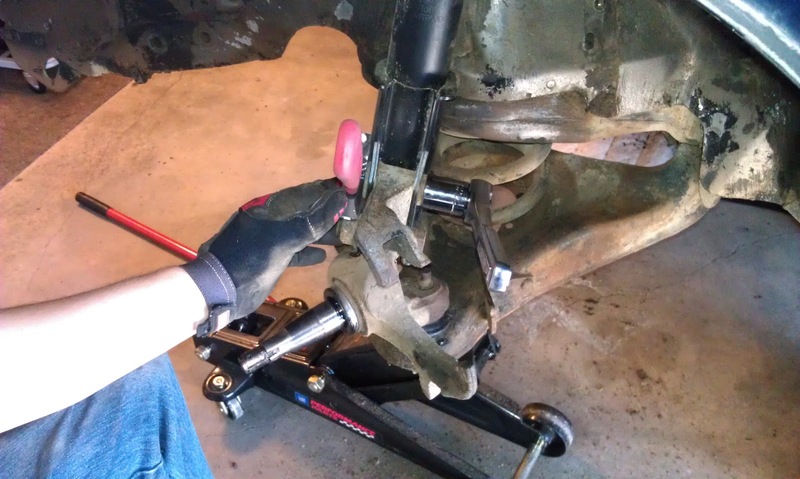 While holding the clamp in position, thread the bolt portion into the threaded end of the C-clamp and hand-tighten it, while visually making sure both discs and the clamp are seated properly. 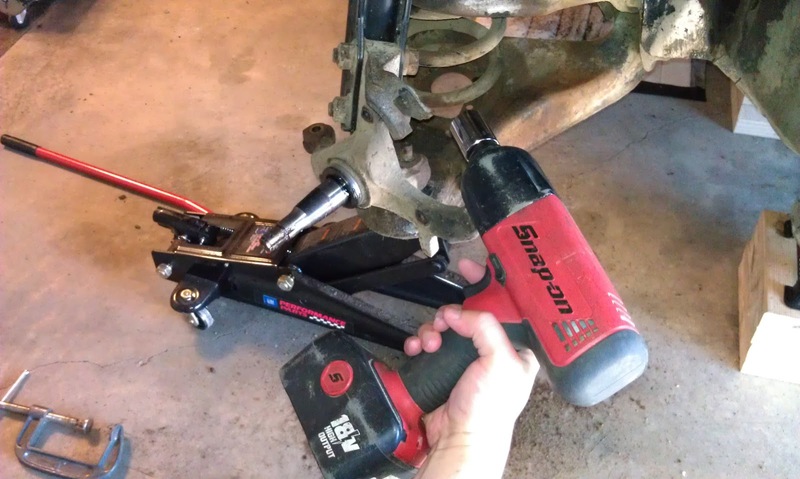 Once it is tight, the clamp should stay in place by itself. Then follow that guy's advice in the video and "crank it down harder". Four hands help a lot. There were three total pops before the ball joint was completely off. 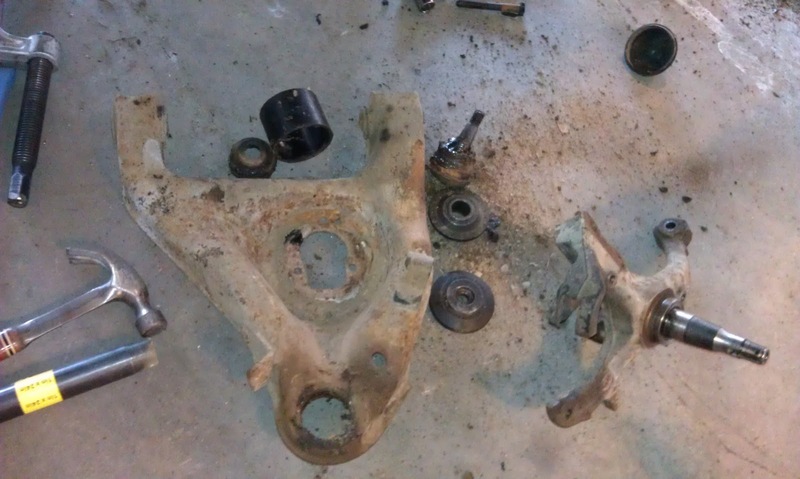 We removed the press after two pops only to find the ball joint had only partially popped out. We had to hook everything back up like before and crank again. There was one more pop and it was out. I needed a break at this point. I went upstairs for a few minutes, and when I returned to the garage "Taps" was playing. 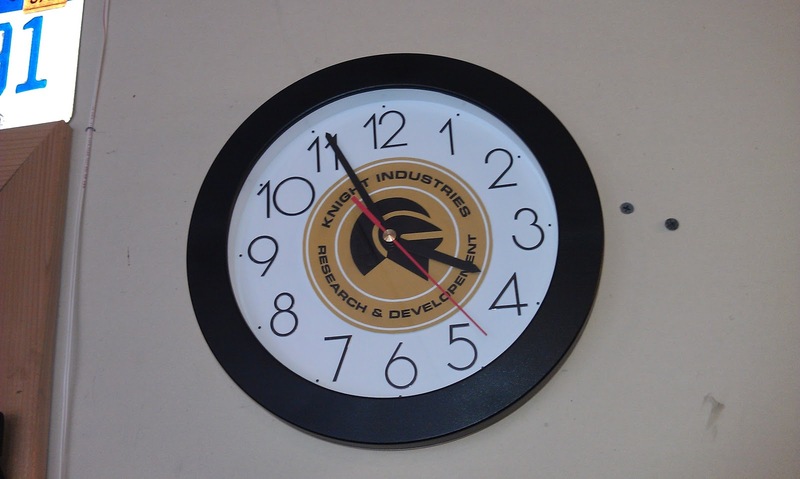 Jonathan had asked Troy about how to remove the springs, and Troy told him to use a bar to pop out the spring, and that there would be very little pressure on the spring because it should be fully extended now that the A-arm is down. So Jonathan used my trusty mop handle as the bar to slide under the spring. My poor mop handle. All those years of service, and this is how its life ends. Trusty to the bitter end! 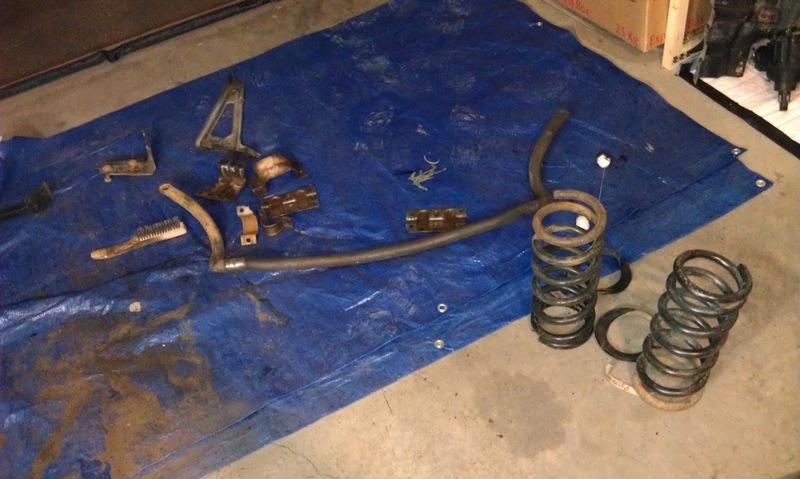 It got the spring out. NOW we are done with this side! It is 1:04PM and we just finally finished the driver side. It only took 3 hours. 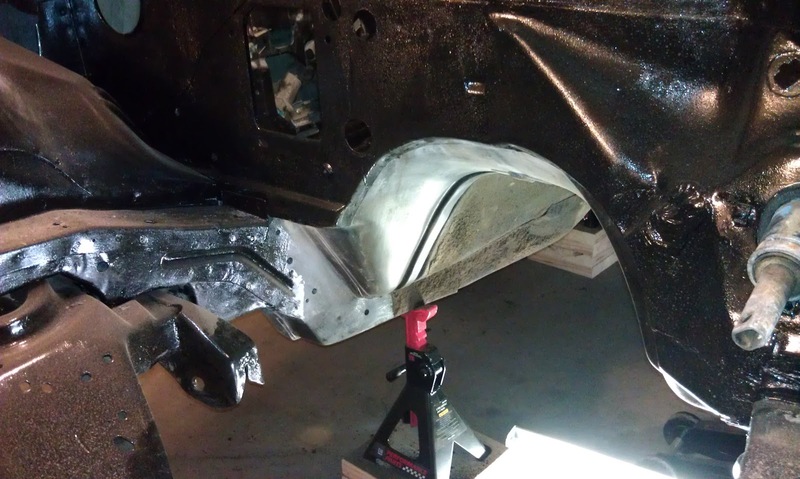 The good news is we have the driver side done. The bad news is we have to do the exact same thing to the passenger side. Except the passenger side is against the garage wall and we only have about 18 inches of space in which to move. I do not have many pictures of removing this piece because I was too busy helping to take pictures (and my gloves were too dirty to grab the camera anyway). We removed one bolt before I took this picture. 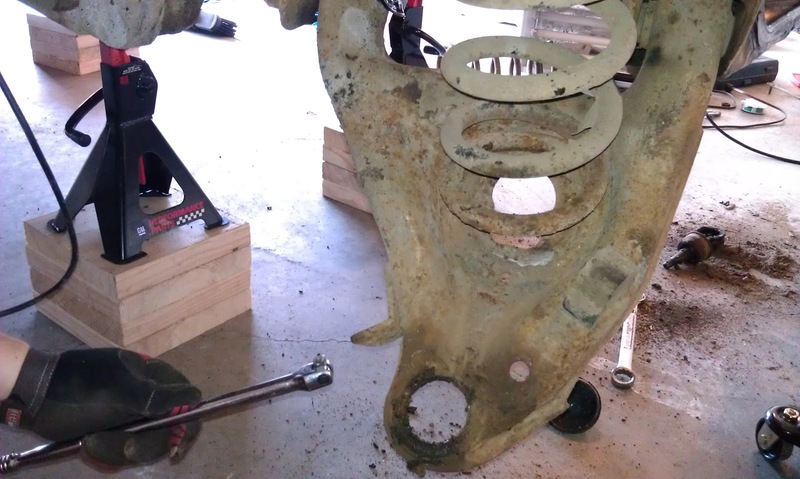 After we removed the bolts (which took a little bit of time because they were apparently seized as well), the spring kicked down and forced the car up. 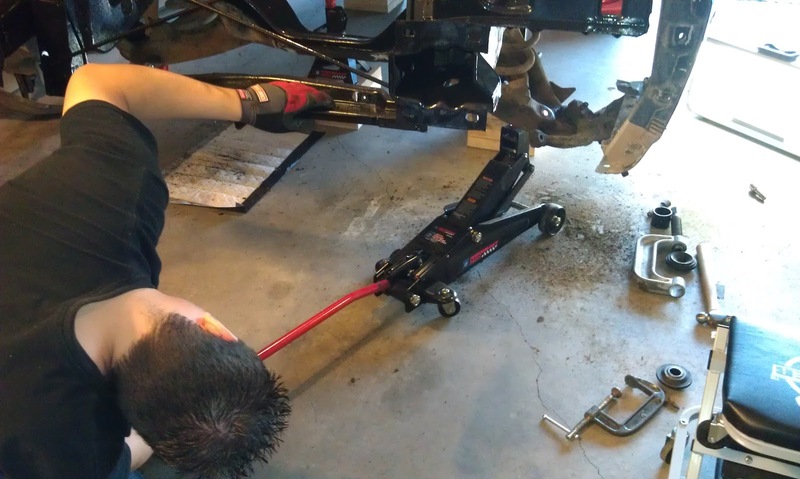 Jonathan was nervous about the car being knocked off the front jack stands after our experience with the driver side, so he came up with the idea of having me sit on the battery tray area in the engine bay to add weight. He unfortunately did not take a picture of me. 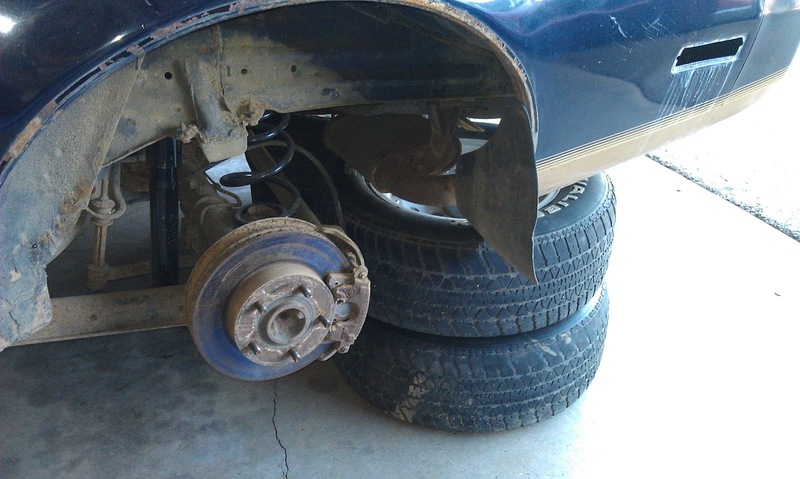 It worked and the car hardly jolted at all. I would like the record to show that I sat on the car to keep it from flying away. This is one of those inside joke kind of stories. A long time ago, Jonathan and I were at work moving furniture. I took a break and sat on a couch, and Jonathan (who was not impressed that I took a break because he wanted to finish) said to me (in front of two co-workers): "Yes Sara, you sit there and keep the couch from flying away while we continue working." It is probably the only derogatory remark Jonathan has ever made to me, and I have never let him forget it (in good humor). 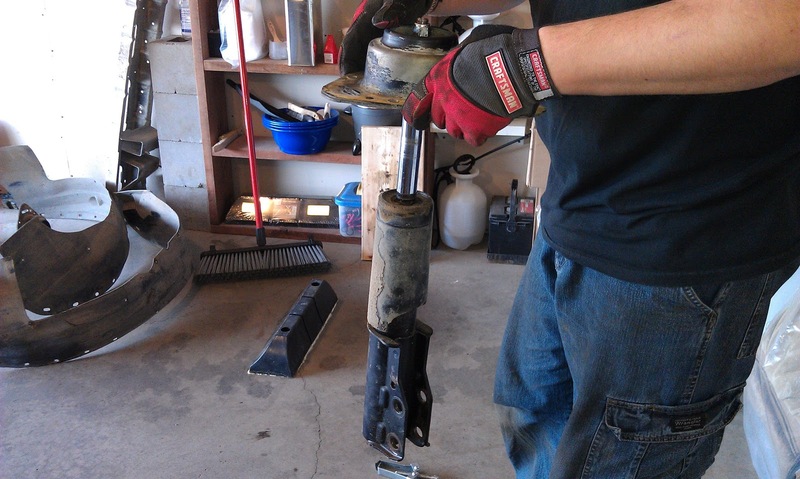 We lowered the jack to release the pressure from the A-arm and then pulled the strut out. This is Jonathan with the passenger side strut. 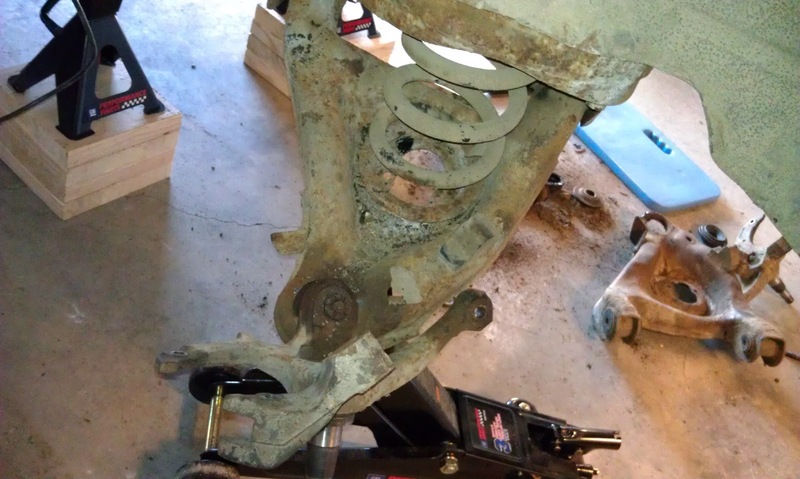 Jonathan said there was no need for me to label the struts and we would remember which strut is which because the passenger side has a cracked bell housing. 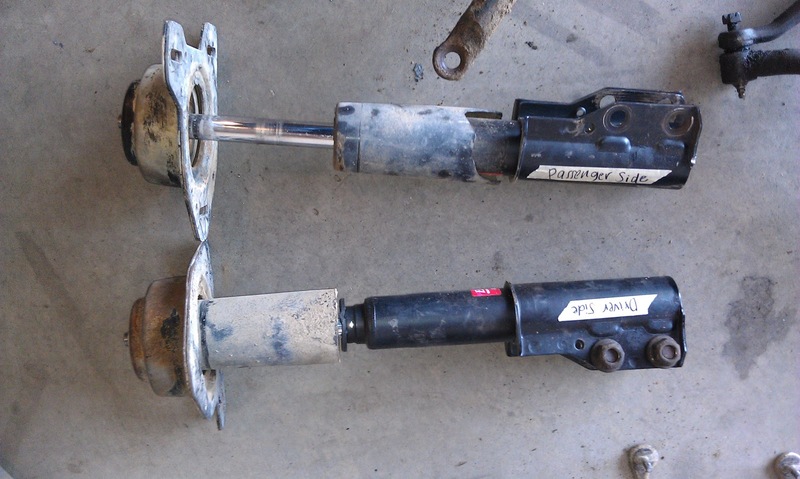 Here are the struts after I labeled them. 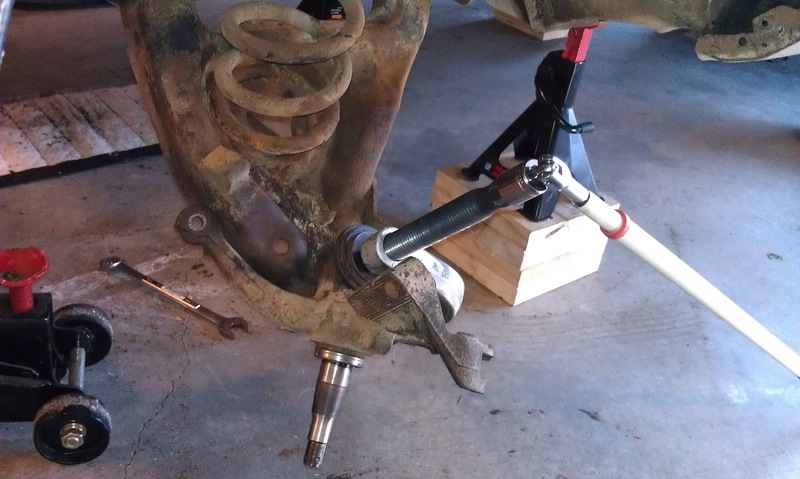 After the strut was out all we needed to do was remove the ball joint and spring. Easy, right? 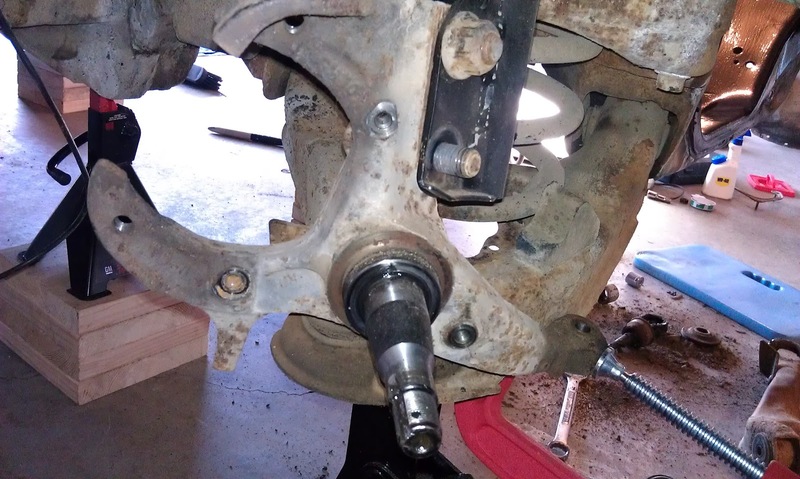 Jonathan got the Ball Joint Press in place like before (although it took a couple of tries because of the different angle). 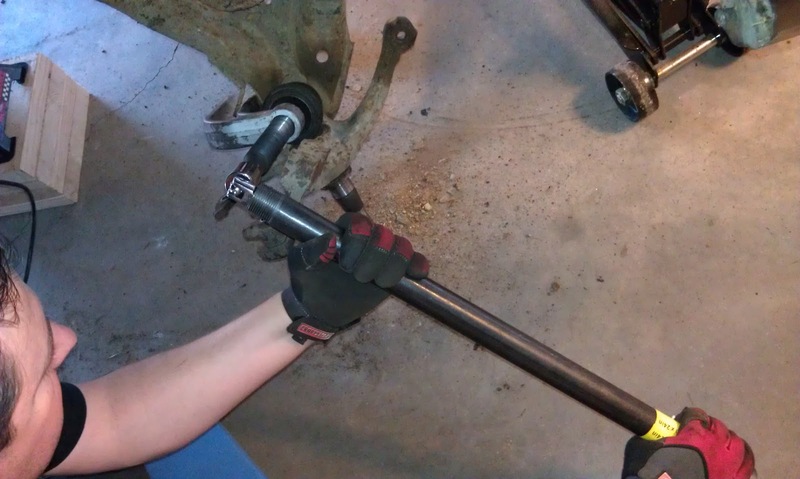 We no longer had our trusty mop-handle-turned-cheater-bar, so Jonathan tried to use the impact driver once he had it clamped down as tight as he could turn it with a wrench. Unfortunately the impact driver's battery was dead. 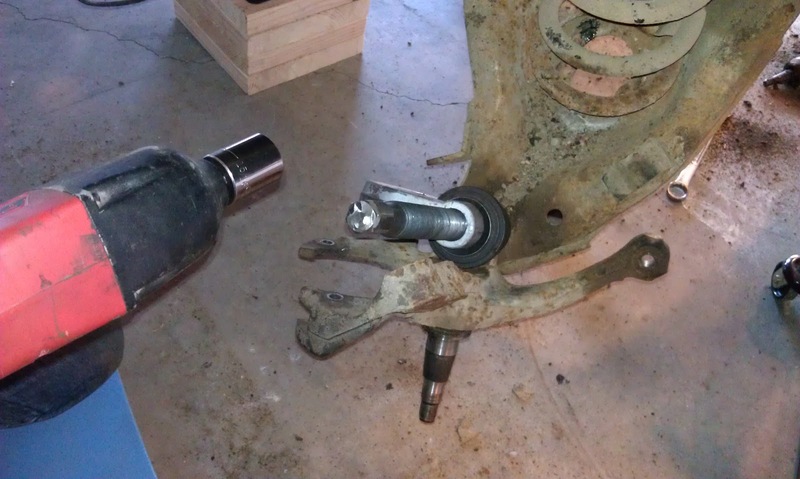 This was a problem because we had a) no bar, and b) no impact driver. So we went to Menards to buy both. Menards had an impact driver on display, but none on hand, so we had to continue without an impact driver. We did buy a 1" x 24" black steel pipe to use as a cheater bar. Another fatality. Jonathan's breaker bar did not survive the encounter. Guess we really needed that impact driver. Jonathan's next breaker bar will be a Craftsman. The spring is out! Our new steel pipe worked great for this. 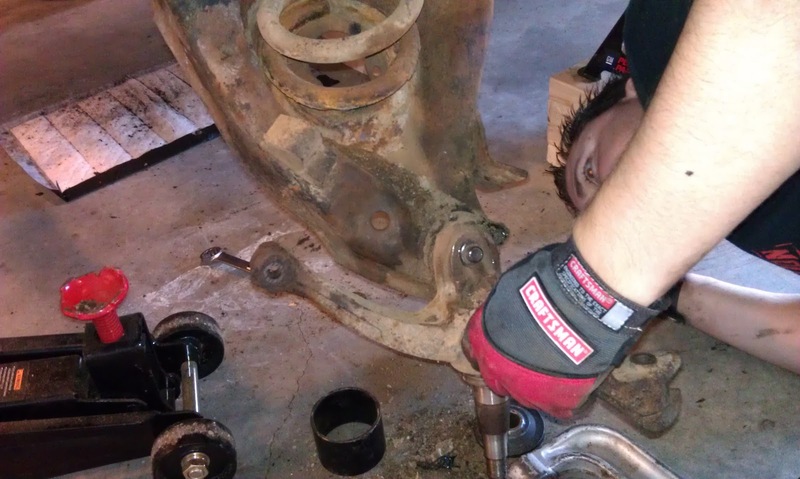 The last thing we had to do was remove the two bolts securing the A-arm. 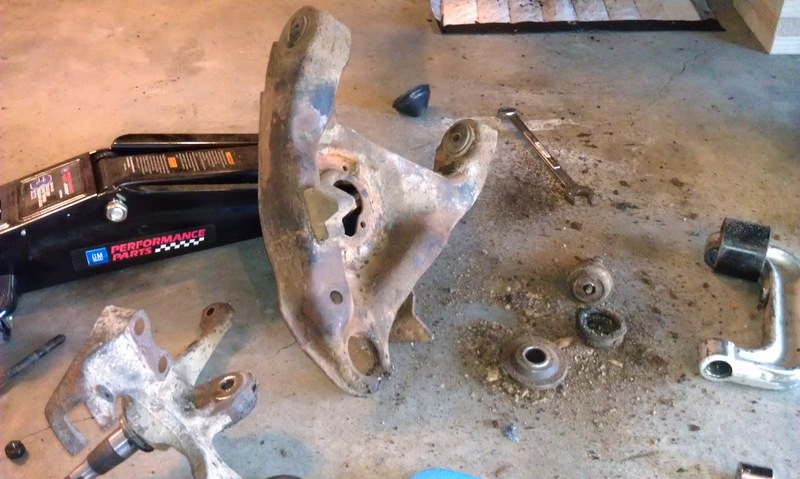 Once the bolts were removed we pulled the A-arm down and out. Three hours later! We took a break for dinner at 4:00PM. After dinner our plan was to brush as much dirt, grease and grime from the bottom of the car as possible in preparation for cleaning and painting. We rolled under the car on our creepers and started brushing. We quickly realized our safety glasses were not enough protection for our faces. 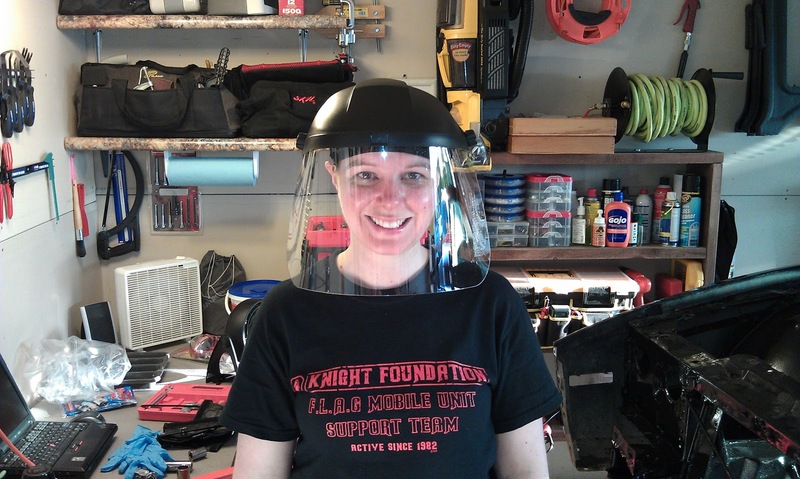 We made another trip to Menards and bought two very fashionable face shields. Here I am modeling mine. We worked underneath the car brushing from the jack stands forward tonight until 9:00PM. 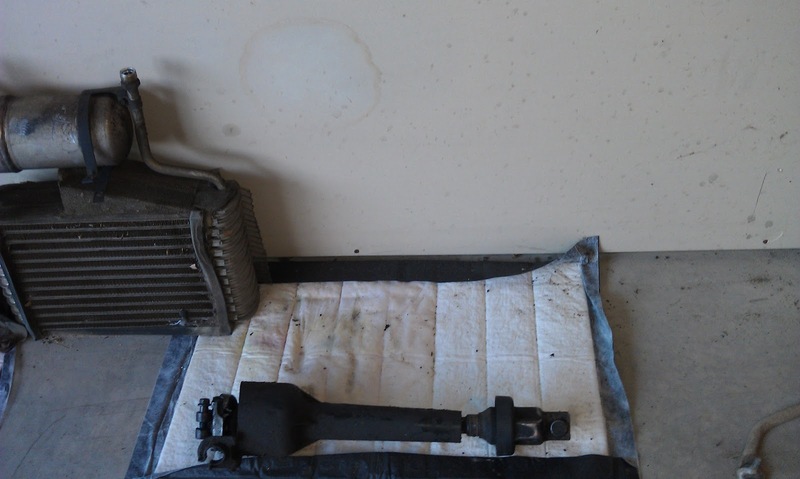 In this picture you can see the contrast between the brushed area and the dirty area. Look at the opening of the drive tunnel versus the drive tunnel itself. 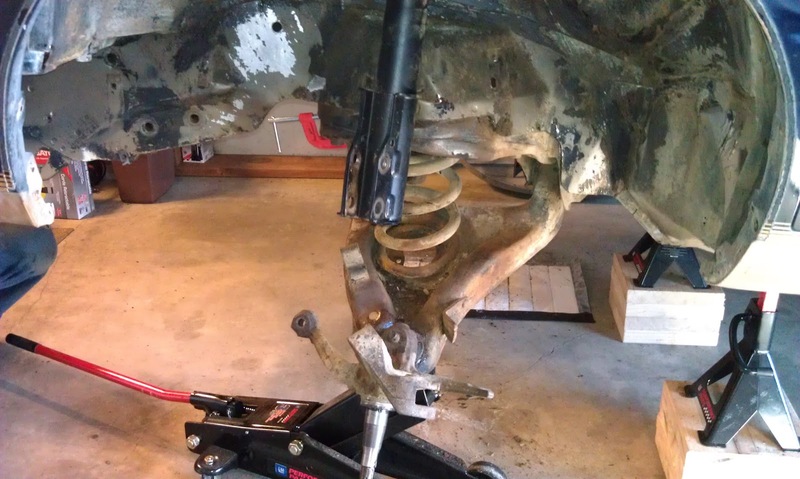 My wonderful dad came over and brushed the springs, sway bar and brackets clean while we worked underneath the car. My dad is saving us a lot of time brushing these parts and we really appreciate his help and company! 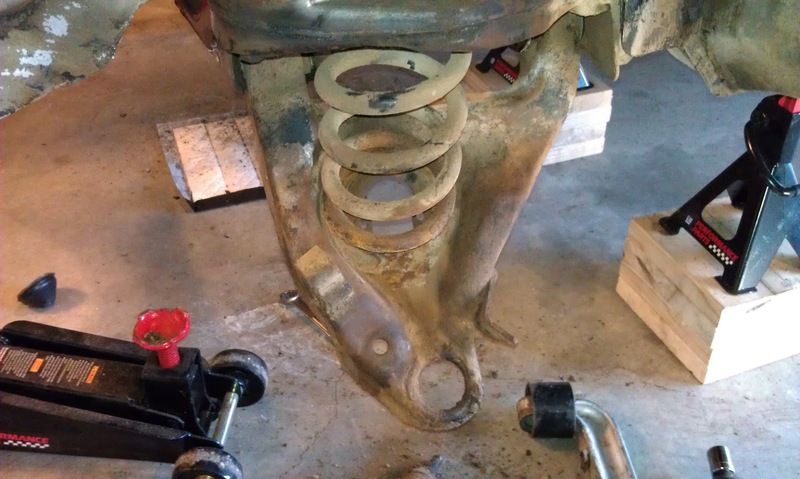 Look how great these springs look now compared to the above pictures! Thank you Dad!